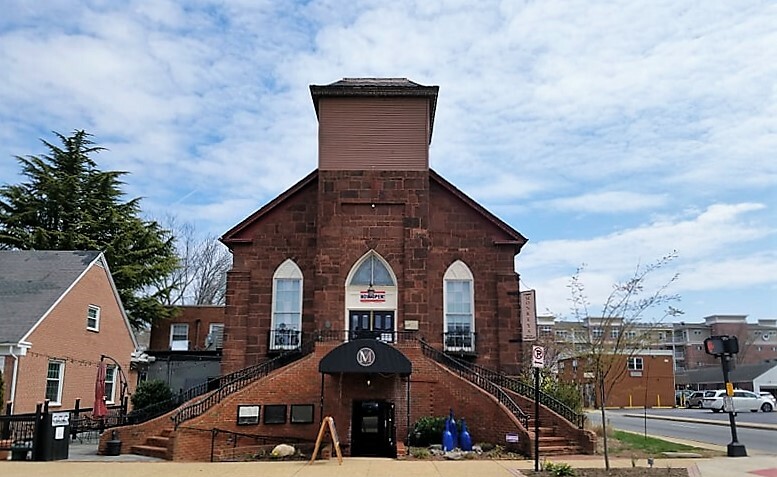 If you're in historic Manassas, look for the renovated church on Main Street. That's the site of Three Monkeys Pub and Chophouse, and you'll want to give them a try! As soon as you arrive, you're faced with two options. Upstairs, you have a pub with drinks and more casual offerings. 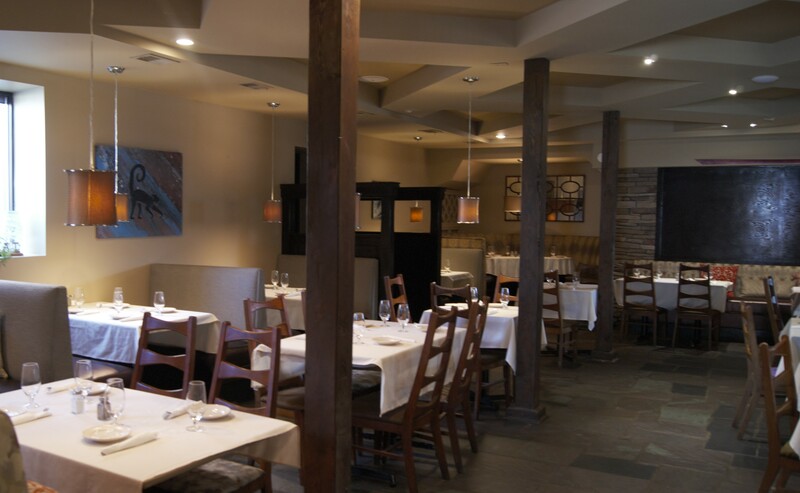 Downstairs, the chophouse provides white tablecloth service and an extensive, meaty menu. "We're going for casual cuisine," General Manager Billy Wiseman explained. "We make almost everything from scratch, even our sauces and dressings. We love our locals; they really keep this place going, but we'd also like to attract new people to this great location." Saturday – Brunch 10 a.m. – 2 p.m.
We walked through the space, and I saw so many different facets of the restaurant. The dog-friendly patio has a window so you can order straight from the bar. The cavernous banquet room can be booked for special events and hosts open mic nights on Thursdays. 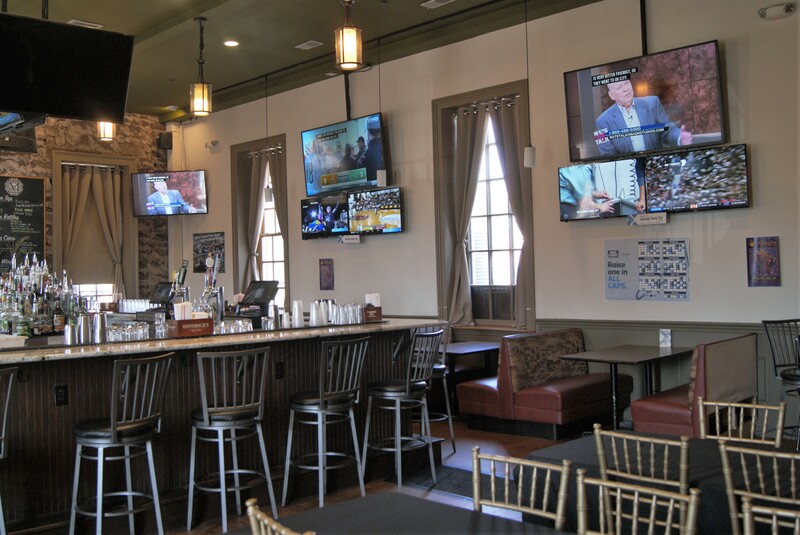 Upstairs, the pub is your classic horseshoe-shaped island complete with jukebox and multiple screens for games. This simple sandwich was actually one of my favorites. 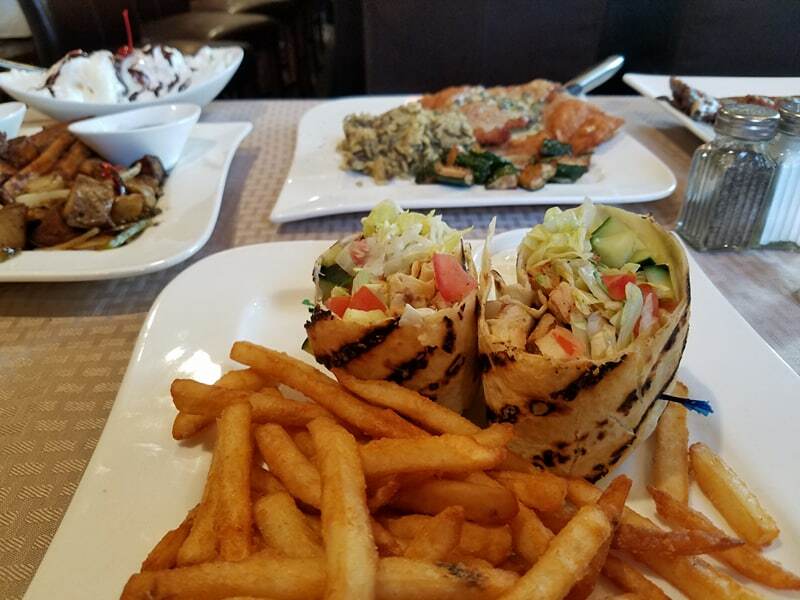 It's the little things that set it apart: a grilled wrap bursting with crisp, fresh veggies and chicken, all served with a housemade ranch tangy with dill. The fries were a good as they look, too! Great Grandma's Tavern Sandwich is a classic Sloppy Joe served with crisp sweet potato fries. Deeelicious! 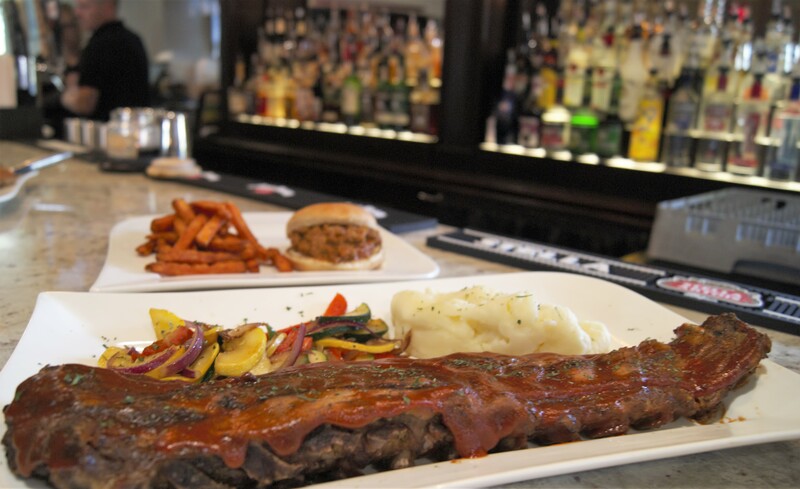 A full rack of ribs comes with generous portions of mashed potatoes and sauteed vegetables here. The meat is fall-of-the-bone tender and brushed with a zesty sauce. 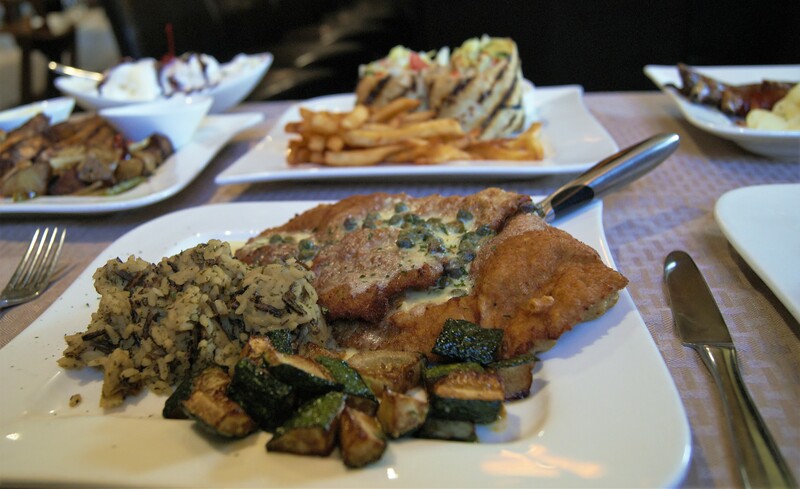 Two veal cutlets are pounded thin and fried crisp with a delicate lemon and caper butter sauce. They are served with fluffy rice pilaf and roasted zucchini on the side. I loved this simple dish! The cream sauce was delicate and fresh in a world of over-done Alfredo sauces. Served with grilled chicken and broccoli, this pasta makes an excellent lunch or dinner. We finished off with a sweet cinnamon french toast (served with home fries if you're there for brunch) and a classic banana split. There is truly something for everyone between the pub and chophouse menus! Who would like Three Monkeys Pub and Chophouse? 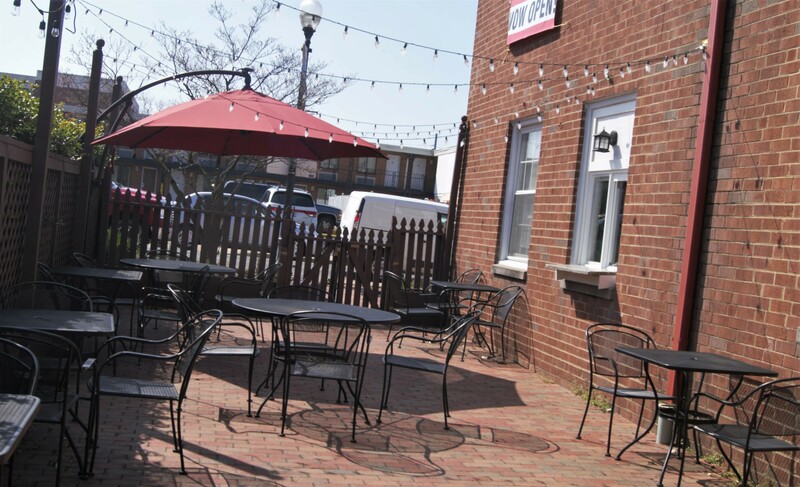 It depends on what you're in the mood for -- patio seating would be great on a nice day if you're running around with your dog. Families would probably prefer the chophouse or patio as well. The pub is where I'd go for a drink after work, to meet up with friends, or for a quick bite. For date night or a special dinner, you definitely want to head to the chophouse entrance and make a reservation just in case. 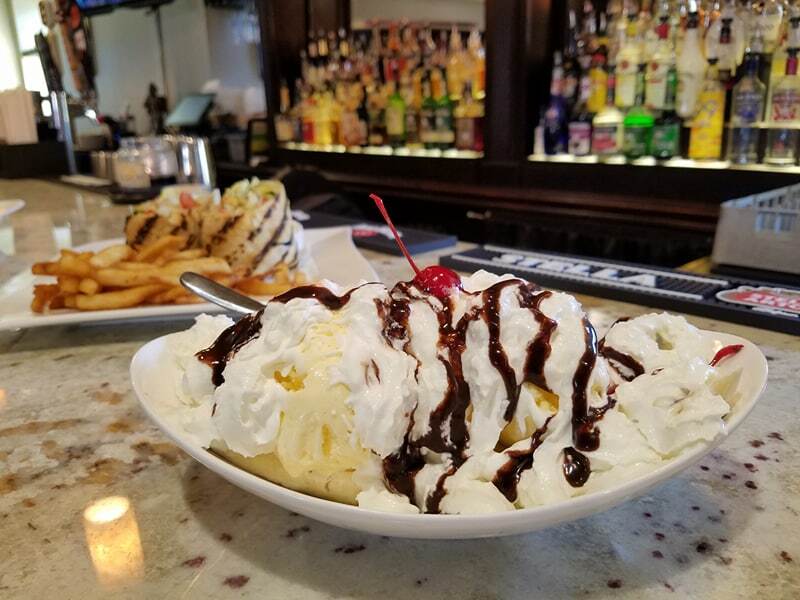 For more information, including menus, event rentals, and reservations, visit the Three Monkeys Pub and Chophouse website. **All photos in this article are by Sarina Petrocelly. Have you tried Three Monkeys? 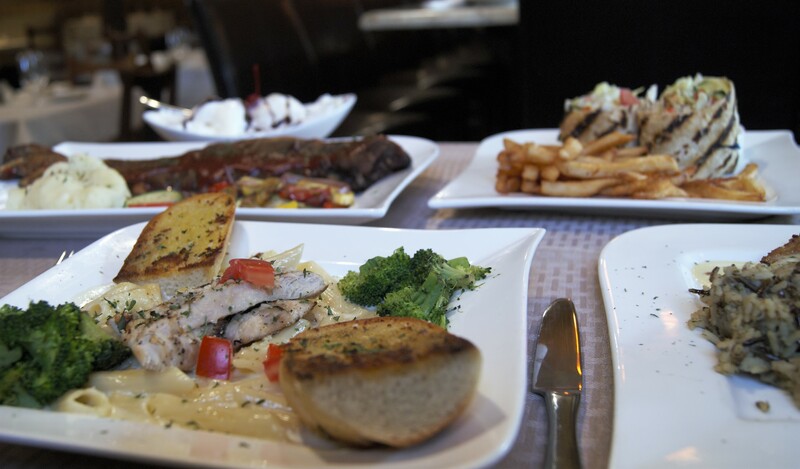 Which side do you prefer -- the pub or the chophouse? Drop a comment and let us know!